Opponents of Venezuela's President Maduro say his move to rewrite the constitution is a way of dodging elections. CARACAS - Violence has broken out in Venezuela's capital, Caracas, with police firing tear gas and protesters hurling petrol bombs during a mass rally against President Nicolas Maduro's plan to rewrite the constitution. 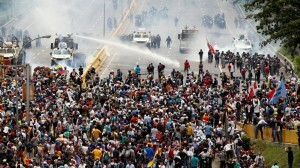 The prosecutor's office said an 18-year-old man was killed in Wednesday's protests. The clashes were the latest in more than a month of unrest sparked by the country's deepening political and economic crisis. Clouds of grey smoke from tear gas canisters filled the air as police with riot shields and trucks advanced along a major avenue in the east of Caracas. Opposition protesters at the head of a demonstration attended by tens of thousands of marchers hurled stones and Molotov cocktails, while officers fired tear gas, rubber bullets and water cannon to push them back. "The city has basically been divided in two. The roads are blocked. You can't move from one side of the city to the other," she said. The opposition has vowed to keep up protests for as long as needed to achieve its main demand of fresh elections. The latest mass protest came after the socialist president launched procedures with the electoral council to convene a "constituent assembly" to rewrite the constitution. Maduro said on Wednesday the vote for the assembly would take place in the coming weeks. He has already said the 500 members of the constituent assembly would be elected by social groups, including workers, indigenous people and farmers, as well as on municipal level. His center-right opponents said that was a way of dodging elections in order to cling to power. "With this constituent assembly, the situation is worse than ever," protester Miren Bilbao, 66, told the Reuters news agency. "It's a tool to avoid free elections. We've been marching 18 years but this is our last card. It's all or nothing." Protesters blame Maduro for an economic crisis that has led to shortages of food, medicine and basic goods in the oil-rich South American nation. An influential group of US senators filed sweeping legislation on Wednesday to address the crisis in Venezuela, including sanctioning individuals responsible for undermining democracy or involved in corruption. But Maduro has received backing from regional leftist allies, including Cuba. Bolivia's President Evo Morales said Venezuela had the right to "decide its future ... without external intervention". At least 34 people have been killed, more than 400 people injured and over 1,000 arrested since the unrest began in early April.